Never Alone came out not too long ago and left a lot of people surprised. I myself had not heard about this game until recently, when I was listening to my favorite video game podcast. Their interview caught my attention and I was determined to try this game out. Do not let this indies title fool you, this game is quite intriguing. Never Alone was developed by the Iñupiat people, Alaska native and Upper One Games. With all this information at hand, lets travel to the land of the Iñupiat people and have an adventure. We follow Nuna(her name might be a reference to Nunamiut meaning “people of land”) on an adventure to stop a blizzard from destroying her settlement. She meets an arctic fox along the way which will help her get to the source of the storm. They encounter different kinds of creatures and puzzles along the way, which they must work together to get through. The story is really the main focus in this game. It’s well written and contains a very lovely story. The way that the story is interlaced with cultural insights really makes the game what it is. Never Alone gives you a emotional attachment to the characters and gives you a better understanding of the Iñupiat people. The cutscenes are narrated by a master Iñupiaq storyteller in his native language, which really adds to the feel of the game itself and makes it that more immersive. Some of the scenes are depicted in scrimshaws for that extra little touch. The visuals look great and have vibrant color palettes. They have a good combination of warm colors, Nuna’s coat for example, and cold colors like snow. They blend well with the textures and they have a nice flow to them. There are a lot of details to look at and rarely does the game have dead areas without anything going on. I only had a couple of times where some textures wouldn’t appear but this happened very rarely. The games mechanics are your standard platformer layout for the most part. You can either play solo, which you have to switch between Nuna and the fox, or you can play co-op. Playing by yourself is done easy enough but you do get the occasional difficult puzzle that you have to be fast on the switching of characters. 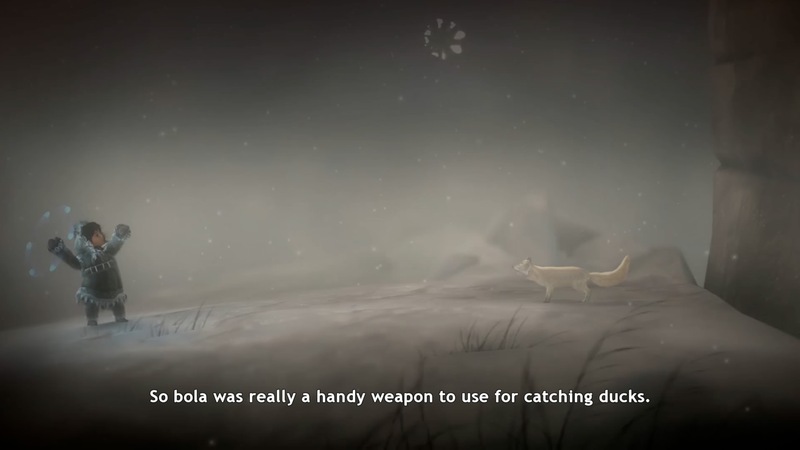 Nuna has the ability to throw a Bola, a native hunting weapon, to detach ice with it and can help solve other similar puzzles in that genre. The fox on the other hand can wall climb, drop ropes and more neat little things further in the game. The 2 protagonists really compliments each other when it comes to their own abilities. 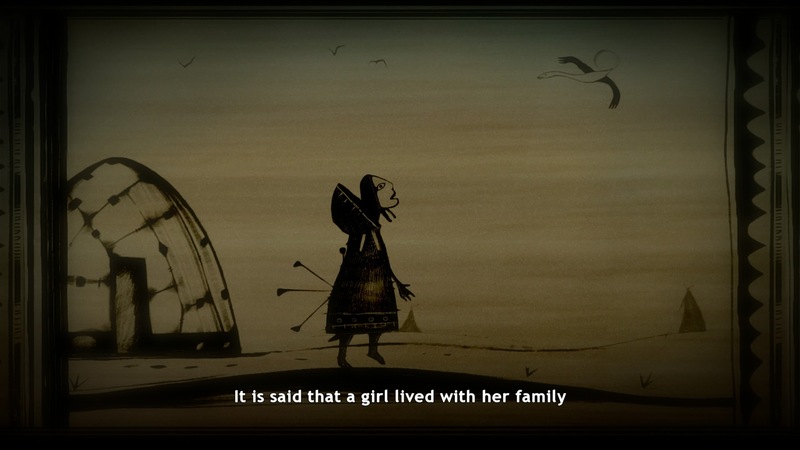 Never Alone main purpose is teaching you about the Iñupiat people and Alaska native. Their culture is delivered in the form of collectibles, in this case, Cultural Insights. These are scattered across the chapters of the game and are given to you by owls. Most of them are relatively easy to find, but sometimes you’ll get the occasional head scratcher. These Insights explain the way of life, the technology used by the Iñupiat people and much more. I really enjoyed listening to all of them. They were really insightful and very pertinent to the storytelling. What’s nice about these little discoveries is that they don’t come right in the middle of an action sequence. They don’t even make you go to the main menu to read them. You just click on the touch pad, read the one you just discovered and go back to playing the game. It’s that easy. You can play the game without reading them, but you wouldn’t be getting the complete experience. Another little tidbit of information about these collectibles: there’s 2 of them already unlock even before you play the game. Go ahead and listen to them. These 2 insights will help you have a better understanding of what the game is about. Never Alone is a very nice game. it’s able to teach you about a subject and being fun at the same time. The story is compelling and offers a great range of emotions. You get attached to the characters quite easily and it takes you on a journey into another culture. The learning aspect is done right without slowing the game down. Never Alone is visually pleasing and has depth. This game is definitely a must have in any gamer’s collection.